Can you believe we’re moving into the final quarter of 2010 already??Gosh! I need to sit down and take a little breather! Lol!Ok, almost at the end of 2010 and I since I’ve recently gotten my happy bubbles back, I have decided that it’s time for a little facelift. No no, I’m not getting plastic surgery done or getting vitamin-C shots or Botox treatments or anything like that. I’m thinking room revamp people! Woot woot! What better way to brighten up your day than to come home to a nice and cheerful pad of your own, kan? Well, unfortunately, I kind of don’t have a place of my own just yet. I’m still bunking with my parents and my in-laws. So I’m making do with redecorating my room for the time being. Haaa… challenging isn’t it? Currently I’m at the drawing board, browsing around for ideas. I very much welcome you creative suggestions on what ways I can go about fitting all our stuff in and still have personal space. Apart from that, I’m giving one of my blogs a make-over as well! 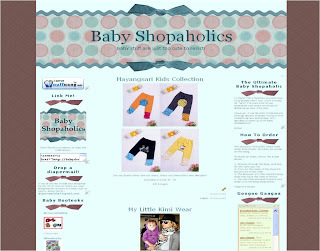 😀 Baby Shopaholics is in the midst of getting a brand spanking new look! I engaged a nice young lady to redesign my review blog and she’s currently aiming to give me a first draft by end of this week. Will update you Doodlers on that once I receive the draft! Till then, stay tuned for further revamp rambles! Alisha and Soraya’s Birthday Party! quiyah : i sure hope so! thanks! i know u can do it! ehehe.. good luck!